A play or theatrical evening? If it’s happening in Macclesfield and the surrounding areas then our Theatre and Drama page is the place to tell our readers. Today HOME announced their new theatre season for 2019, with a continued commitment to bold international programming, nurturing new creative talent, and building-wide festivals and celebrations. The season includes the acclaimed production of Wise Children directed by Emma Rice, whose work includes including Kneehigh’s Brief Encounter and Tristan & Yseult. Choreographer Hofesh Shechter’s Grand Finaleis back following a sell-out run at HOME earlier this year; Headlong are back with their new production of Shakespeare’s Richard III; and theatre innovators 1927 present their smash-hit The Animals and Children Took to the Streets. Then in July, there’s Kemp Powers’ One Night In Miami, directed by former Royal Exchange Associate Director Matthew Xia. This powerful production imagines the pivotal moment in American history when Cassius Clay met his friends Malcolm X, Sam Cooke and American Football star Jim Brown following Clay’s heavyweight championship victory. 2019 marks the beginning of a new phase for HOME, where there will be a renewed commitment to not just producing new work, but also growing our collaborations with exciting artists. This season HOME supports World Premieres by Scottee, Javaad Alipoor and Liz Richardson. Javaad’s production Rich Kids of Tehran will be his first new commission since his landmark The Believers Are But Brothers brought him to national attention. Scottee’s new show Class will be his first show at the midscale, opening in HOME’s larger Theatre 1space. As well as World Premiere productions developed with HOME, there is a carefully curated programme of new work featuring celebrated emerging artists and award-winning shows from international festivals. It includes Bertrand Lesca & Nasi Voutsas’s new production One,Iman Qureshi’sPapatango Prize winning play The Funeral Director, and a return of Scottee’s hit Fat Blokes.There are also acclaimed Fringe First winnerswith Breach Theatre’s It’s True, It’s True, It’s True, and Dressedby This Egg. 2019 will feature a vibrant programme of building-wide festivals and seasons which include major productions in the theatres. In April HOME’s annual ¡Viva! Festival of Spanish and Latin American art returns for a 25th year. It features the HOME-commissioned Kingdomby award-winning Catalan company Senor Serrano. HOME will also mark Refugee Week, with a mixed programme including Iranian artist Nassim Soleimanpour’s production Nassim. Alongside all this, HOME will welcome the famous and the funny to its theatre spaces. Highlights include comedian Mark Thomas with his theatrical examination of our National Health Service in Check Up: Our NHS @ 70; RuPaul’s Drag Race favourite Jinkx Monsoon; and HOME regulars The Tiger Lillies takinga trip into the Devil’s Fairground. HOME also offers a year-round platform where people throughout Manchester’s communities, especially young people, can engage with the arts. Highlights of a packed programme for 2019 include a new show from CAN Young Artists, and the return of National Theatre Connections Festival, bringing together some of the most exciting writers in the country with the theatre makers of tomorrow. Pottage, cucumber pickled in verjuice, salted fish and marchpane flowers will all feature on the ‘menu’ for the 2019 season at Little Moreton Hall. Tudor ‘gentlewomen’ at the stunning timber-framed mansion near Congleton will describe what was on the table when the Moreton family, their friends and servants sat down to eat in the sixteenth century. At various times during the year, you will be able to sample items such as those Tudor pickles, gingerbread and beerbread; all made according to recipes which have survived. You can have a go at making butter and discover how cheese and other foods were prepared. These products were the staples of a diet which the Tudors believed kept them healthy in body and mind. You will be able to investigate the basics: Pottage was a cheap stew made with grain and vegetables and eaten by servants and farm workers. Wealthier people added some meat, but that was turning it into a luxury dish. You can follow the trends: Verjuice, which adds some really sharp acidity to meat and vegetables, is becoming fashionable again today. Now, it is made from pressed grapes, but the Tudors were more likely to use pressed crab apples. Beer was different too,because it was made without hops. Beer was very important. It was the everyday drink for everyone – including the children- because water was not always clean enough to be safe. Again, beer was definitely on the prescription for a healthy life. She added, ‘Discovering about foods appeals to people of all ages. We’re sure our young visitors will have just as much fun as their parents and grandparents investigating it and, because food is closely linked to health, we will also look at other Tudor ideas on healthy living, including the herbs and flowers they used in ‘remedies’ for all types of ailments. The 2019 season at Little Moreton Hall begins a few weeks later than in previous years. During the winter the National Trust has completely re-wired the Hall, at a cost of more than £200,000. The work involved laying 9000 metres of cable and included installation of a state-of-the-art fire alarm and security system. The project will help to secure the future of this very special 500 years old building. 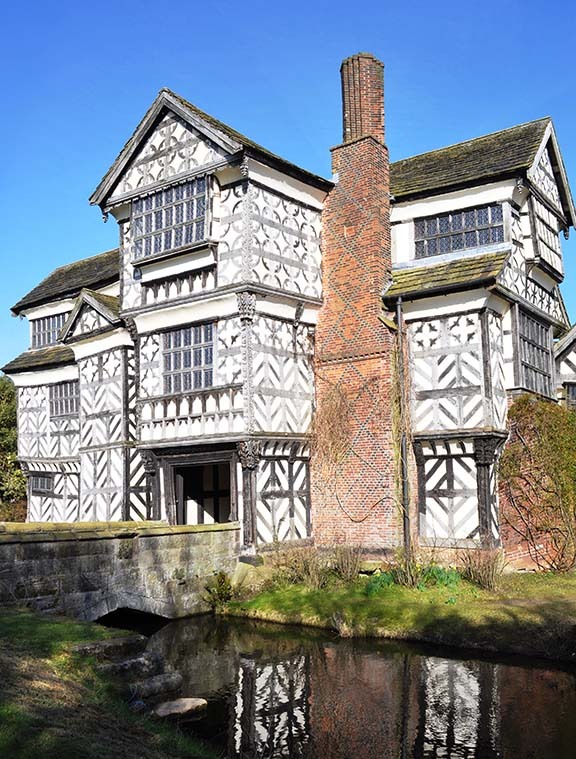 Little Moreton Hall opens for the 2019 season on Saturday 30 March and is then open Wed-Sun, 11am – 5pm. For more information visit www.nationaltrust.org.uk/littlemoretonhallor call 01260 272018. Wilmslow Guild Players are an amateur theatre group formed in 1926 at the Wilmslow Guild, an independent adult education centre.